Booking a ski holiday can be tricky. There are so many options to choose from and different prices to consider. Skiing doesn’t necessarily mean spending all of your savings on a week long holiday. It’s something everyone can enjoy. Do you want to go skiing but you’re worried about how much it will cost? Look no further. Here are the 5 cheapest resorts for skiing this season. Described as the ‘Pearl of Mont Blanc’, this traditional farming village, turned ski resort is great for affordable ski holidays. The charming wooden architecture and the stunning views of Mont Blanc make Combloux a great place to visit this season. Combloux is located just 1 hour and 40 minutes from Geneva airport. Book an affordable airport transfer with Alps2Alps for a reliable and convenient service. A one way, midweek transfer for four people will cost €111. There are a range of affordable chalets and hotels available in Combloux. You can expect to pay €140 per night for a group of 4. You can also find different deals depending on your group size and the length of your stay. Lift passes cost €36 per adult, per day. To save more money, book your pass online. If you book 10 days in advance, you can get 6 days for the price of 5. Perfect your skills on the slopes and book a ski lesson. A two hour lesson for 1-2 people will cost you €160. You can also book lessons for groups or for children. You may think that eating at a restaurant will cost you the world but there are plenty of cheap dining options. A meal for 2 will cost you around €50. That’s including a main, a dessert and a drink. If you like to measure the cost of a holiday by the price of a pint then you’ll be relieved to know that the average pint costs €5 in Combloux. Saint Gervais is an old but beautiful resort in the French Alps. It is an ideal place to relax and the locals will often encourage you to take a break. Make sure you visit one of the town’s boutiques or try your hand at a game of poker! Saint Gervais is just over an hour away from Geneva airport. With an Alps2Alps transfer you can book a one way, midweek transfer for €126 for four people. Whether you’re staying in a chalet or a hotel, you can be sure you won’t be spending too much money. One night’s stay for four people will cost €150. 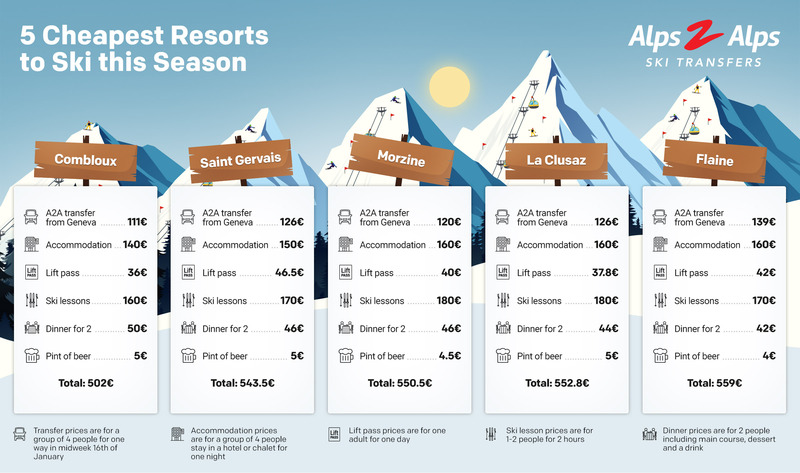 An adult can ski in Saint Gervais for €46.50 per day. The resort also offers family discounts and a reduced price for tickets bought online. You can enjoy hopping on a ski lift, knowing you’ve made great savings! Ski lessons aren’t as expensive as you’d imagine. A lesson for 1-2 people for two hours is €170. The children’s package includes a lift pass with the price of the lesson. You can treat you and a friend or partner to a meal out at an affordable price. A meal for 2 people, including a dessert and drink costs €46. Wind down after a day of activities with a €5 pint and take in the beautiful scenery of Saint Gervais. Morzine is great for a budget ski holiday. If you’re a beginner or you have children, this is the resort for you. The resort has a traditional Savoyard feel and is perfect for a relaxing ski break. There are plenty of activities to enjoy and restaurants and bars to try. Morzine is approximately a 1 hour and 50 minute drive from Geneva airport. A midweek, one way transfer for four people is €120 with Alps2Alps. Prices are calculated according to group size, distance and the time of your flight. A night’s stay in Morzine will cost around €160 for four people. There are plenty of cosy chalets to choose from as well as apartments and hotels. An adult day pass costs €40. Book a group ski pass or ‘duo pass’ for an even cheaper deal. A 2 hour lesson costs €180. There are many different ski lessons available depending on your group size and ability. Eat out for €46! Two people can enjoy a main, dessert and a drink for this price. A pint of beer will cost you €4.50 in Morzine. You can enjoy your Après ski knowing you’re not burning a hole in your pocket. La Clusaz is a great resort for families. It’s full of activities and there are a range of slopes for all abilities. It’s also very affordable and there are many deals and offers that you can take advantage of. La Clusaz is located about an hour and a half from Geneva airport. You can save money on a midweek transfer with Alps2Alps. A transfer for four people, one way will cost approximately €126. Stay in La Clusaz for €160 a night. Depending on your needs, you can stay in a chalet, hotel or you can camp! A one day adult lift pass will cost €37.80. Be sure to check the different packages on offer to get the best deal. A two hour lesson for two adults will cost €180. There are a few ski schools in La Clusaz that offer a range of lessons and courses. You can feel guilt free about eating at a restaurant. A meal for two people will cost around €44. A pint will cost you €5 in La Clusaz. You can sit back and relax in one of the resort’s restaurants or bars after a long day of activities. Situated in one of the largest ski areas in France, The Grand Massif, Flaine is a beautiful place to spend your ski holiday. It has a rich history and is full of culture. The resort has a ‘ski-in, ski-out’ design which means it is car free and pleasant to stroll around. Flaine is less than a two hour drive from Geneva airport. You can travel one way for €139. This is the cost for a group of four, but you can get a personalised quote for your group size. Stay in Flaine for €160 per night. Book early to get the best accommodation deals. A day pass for an adult will cost €42. Children under 5 and adults over 75 also ski for free. A two hour adult ski lesson costs €170. There are also snowboarding lessons and private instructors available. Dinner for two people will cost around €42. If you want to treat yourself, there are plenty of great dining options in Flaine that won’t cost you a fortune. Drink for only €4 in Flaine! You can enjoy a pint without stressing about how much you’re spending. With these great deals, why wait to book your ski holiday? For the most reliable and affordable door to door service, book a transfer with Alps2Alps today.